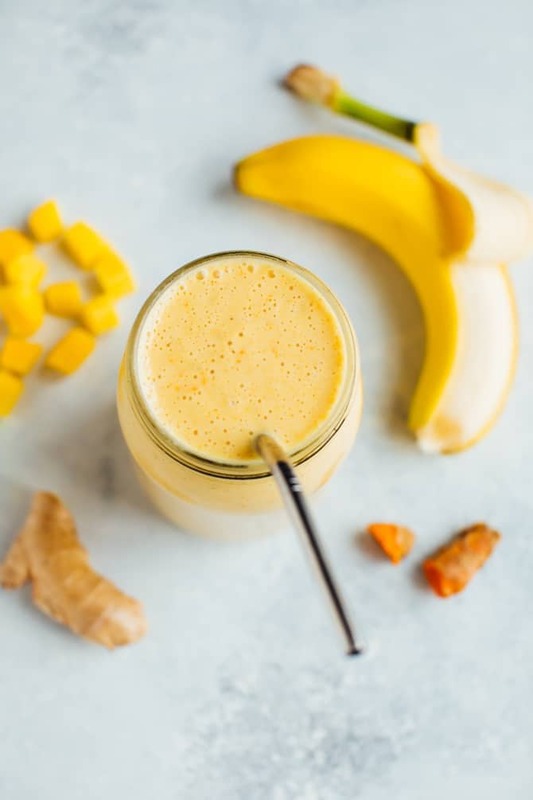 This golden milk smoothie with fresh turmeric, ginger and mango is the perfect way to refuel after a workout. It has the protein and carbs your body needs along with anti-inflammation properties to help your body recover. This post is sponsored by Kroger. Does this smoothie not scream spring? The bright sunny color and the flavors. And it’s so refreshing and healing for a post workout snack! Mango – besides being absolutely delicious, mangos are a great source of carbohydrates and antioxidants. You want to get carbohydrates to your muscles as fast as possible after a workout to replenish your muscle glycogen stores. Mango is also known to reduce inflammation which is also super helpful after a workout. Banana – packed with potassium and manganese which help prevent muscle cramps, heal wounds, and increase bone strength. And another awesome source of carbohydrates. Yes, yes, yes! 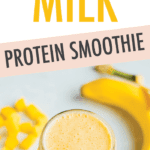 Greek yogurt – a great protein boost for this smoothie, but you can also sub in a plant-based protein powder here if you want to keep it dairy free! 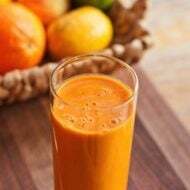 Turmeric – an anti-inflammatory powerhouse that compares to over-the-counter anti-inflammatory agents, as well as, some prescription medications. It has also been shown to help with joint pain and joint swelling which I can sometimes feel in my knees after a long run! Ginger – one of my favorite flavors and has a ton of health benefits. It helps with muscle pain and soreness and is anti-inflammatory (see a theme here?!). 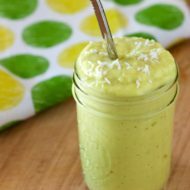 A must in my post-workout smoothie recipe! Cinnamon – this sweet spice is not only a powerful antioxidant, but it also contains anti-inflammatory and immunity-boosting properties. 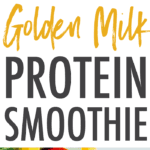 Black Pepper – I know this seems like a random ingredient in this smoothie, but it’s an important one! 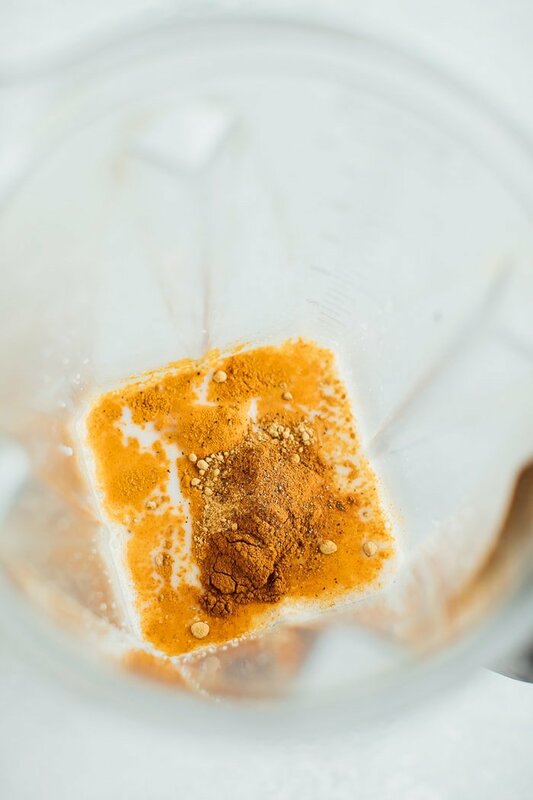 A chemical in black pepper helps the body absorb the key substance in turmeric. So consuming black pepper and turmeric together helps you get alllll the goods! Bonus ingredient: Pineapple – rich with the enzyme bromelain, which aids in the digestion of protein and can help curb inflammation. It’s also packed with vitamin C, an important antioxidant for tissue growth and healing. I purchased everything I needed for this smoothie from my local Kroger, including fresh ginger and turmeric and the Simple Truth organic frozen mango. Kroger is the closest grocery store to us and they have an awesome natural and organic section. 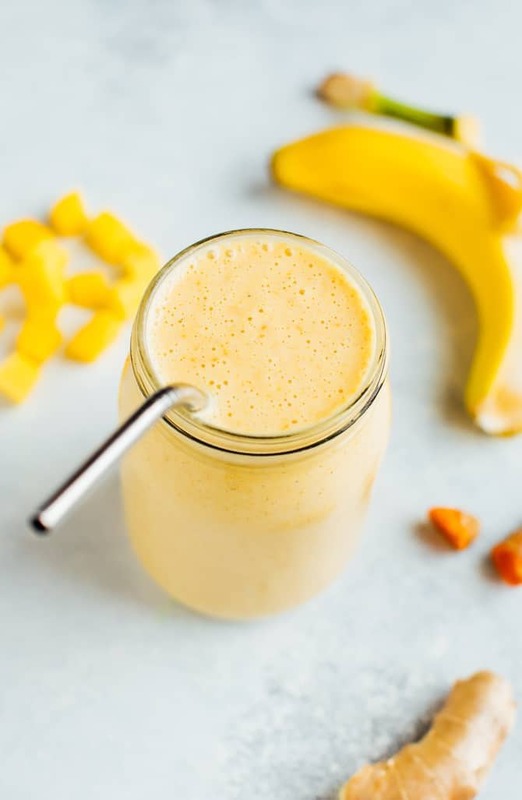 This smoothie will be helping me recover from my last few training runs and will definitely be on the menu for a post-race recovery. I hope you love it as well. Monument Ave 10K, I’m ready for you! 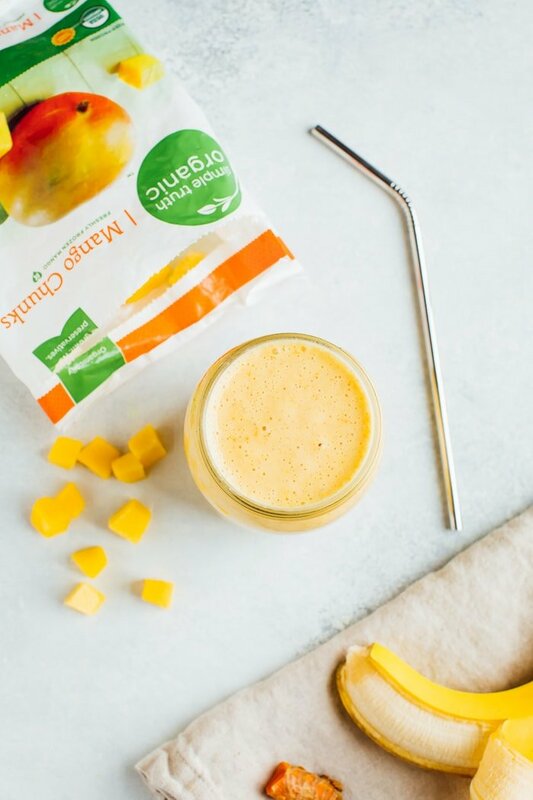 This golden milk smoothie with fresh turmeric, ginger and mango is the perfect way to refuel after a workout. It’s got the protein and carbs your body needs along with anti-inflammation properties to help your body recover. Blend everything together in a high powered blender until smooth. Pour into a cup and enjoy. Feel free to swap the frozen mango for frozen pineapple or do a mixture of both! Do you have any races planned for this year? If you’re running the Monument Ave 10K as well, maybe I’ll see ya at the packet pickup this week or on race-day. Say hi if you see me! 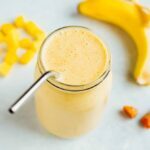 this golden milk smoothie look very health, like it, and ll try . As the summer approaches I decided to lose some weight so I was looking around for some recipes.I’m glad I found you’re beautiful blog. 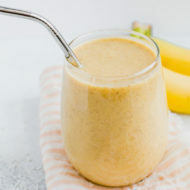 Already tried the golden milk smoothie and the oatmeal with caramelized bananas.In addition to these delightful recipes I started started a 2 week diet plan which is extremely popular all over the internet so decided to give it a try I have nothing to lose. The best part is that if you’re not sotisfied, you get your money back. This is the diet I’m talking about https://bit.ly/2HxpKOY. Yummy! Easy to make and filling! Love all the flavor! Zone diet. Made with whole medium banana, scoop of Syntrax Fuzzy Navel Whey protein powder and Tbls Berrios Olive Oil.